The massive Venice Biennale is now in full swing, and one of the stars of the show is Starn Studio's Big Bambu project, a 50-foot-tall nest of bamboo that rises above the Grand Canal in grand fashion. The art project is a round tower made entirely of bamboo shoots with a spiraling walkway that reaches the apex. 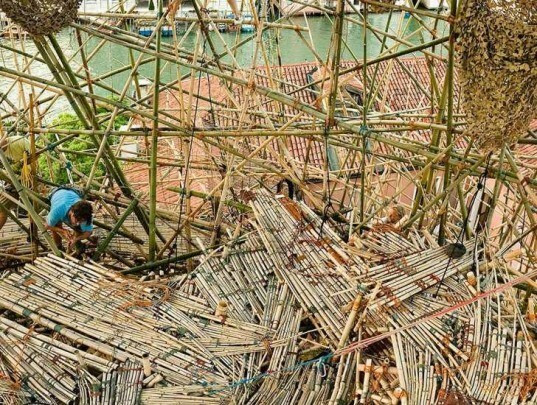 Artists Doug and Mike Starn and a team of rock climbers will be lashing more and more bamboo until June 15th when the project closes, creating a devloping, changing building from the living material. The Starns explain how their 2010 Big Bambu installation at the MET in New York became the seed for this new undertaking: “we are grafting a new Big Bambú and using 1,000 poles from the Met as stem cells, the Venice piece will still be the Metropolitan piece but also a new one”. They also brought in 2000 additional bamboo poles grown in southern France to feed the project. Much of the original project is now used for the platforms and walkways. The bamboo edifice is currently erected next to the famous Peggy Guggenheim Collection on the grounds of the old US consulate along the Grand Canal. 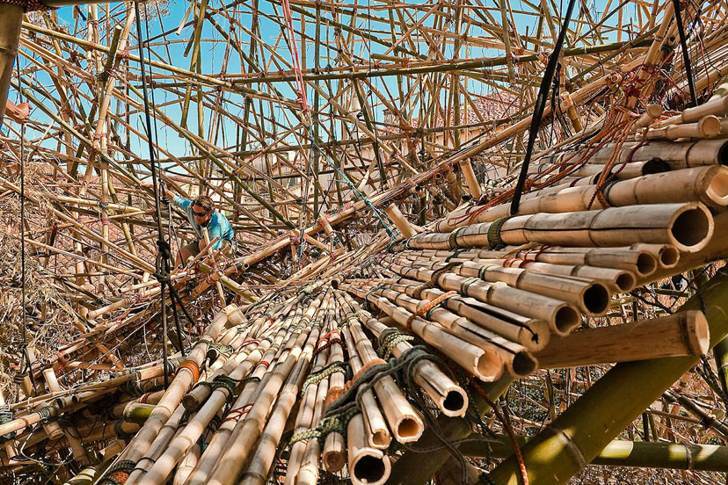 Its presence is a bit jarring in the old, immaculately designed city – bamboo poles cross each other in a seemly chaotic weave that organically rises up to the skyline. Simple rope lashes all of the joints together. A small path is laid within the spiral, adding modest egress to the 50-foot-high platform made of bamboo salvaged from the previous incarnation of the project. The work is intended to inspire the qualities of growth and change. Since it has been placed in a city that is under tremendous pressure to adapt to a shifting environment, the Big Bambu serves as an apt metaphor. The Starns explain how their 2010 Big Bambu installation at the MET in New York became the seed for this new undertaking: "we are grafting a new Big Bambú and using 1,000 poles from the Met as stem cells, the Venice piece will still be the Metropolitan piece but also a new one”. Much of the original project is now used for the platforms and walkways. They also brought in 2000 additional bamboo poles grown in southern France to feed the project. Much of the original project is now used for the platforms and walkways. The bamboo edifice is currently erected next to the famous Peggy Guggenheim Collection on the grounds of the old US consulate along the Grand Canal. Its presence is a bit jarring in the old, immaculately designed city - bamboo poles cross each other in a seemly chaotic weave that organically rises up to the skyline. Simple rope lashes all of the joints together. A small path is laid within the spiral, adding modest egress to the 50-foot-high platform made of bamboo salvaged from the previous incarnation of the project. The work is intended to inspire the qualities of growth and change. Since it has been placed in a city that is under tremendous pressure to adapt to a shifting environment, the Big Bambu serves as an apt metaphor. The Starns explain how their 2010 Big Bambu installation at the MET in New York became the seed for this new undertaking: "we are grafting a new Big Bambú and using 1,000 poles from the Met as stem cells, the Venice piece will still be the Metropolitan piece but also a new one”. They also brought in 2000 additional bamboo poles grown in southern France to feed the project. Much of the original project is now used for the platforms and walkways.